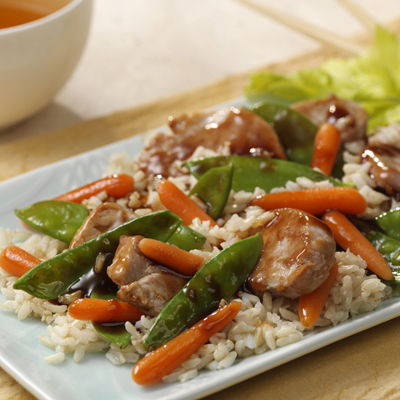 Stir together barbecue sauce, honey, soy sauce and crushed red pepper in small bowl; set aside. Spray large nonstick skillet or wok with cooking spray; heat over medium-high heat. Add pork; cook 4 to 6 minutes or until cooked through, stirring occasionally. Add barbecue sauce mixture and carrots; cook 10 minutes, stirring occasionally. Add pea pods; cook 2 minutes or until pea pods are bright green and mixture is hot, stirring occasionally. Serve over hot cooked brown rice, if desired.